This facial cream offers carefully selected bio-available ingredients that provide superior hydration in addition to anti-aging, antioxidant, smoothing and calming benefits. Pure Rose Otto, the queen of essential oils, is calming, uplifting and deeply nourishing. Rare and precious Argan oil is endowed with a spectrum of antioxidants like Vitamins A and E. Light but rich, Argan is also loaded with complexion-loving Omega-6 fatty acids, and Linoleic acid, and absorbs rapidly to boost cell production, which is essential for any anti-aging product. Shea Butter and Sunflower Oil enhance glow and reverse sun-damage. Marshmallow plumps the skin and soothes troublesome conditions, such as dryness and premature aging. To Pangea, a great moisturizer is the foundation of any skin care ritual. It should be equal parts protector, harmonizer and enhancer and the high alchemy of Earth’s most exquisite botanical ingredients. It must bring joy and pleasure to the senses, and should only ever enhance your light. We know that’s a tall order — and this luxuriously hydrating cream, formula for normal-to-dry skin, delivers on all. To optimize its effects, use both morning and night. Avocado and Pumpkin Seed Oils deeply hydrate while offering an array of skin-beneficial nutrients. 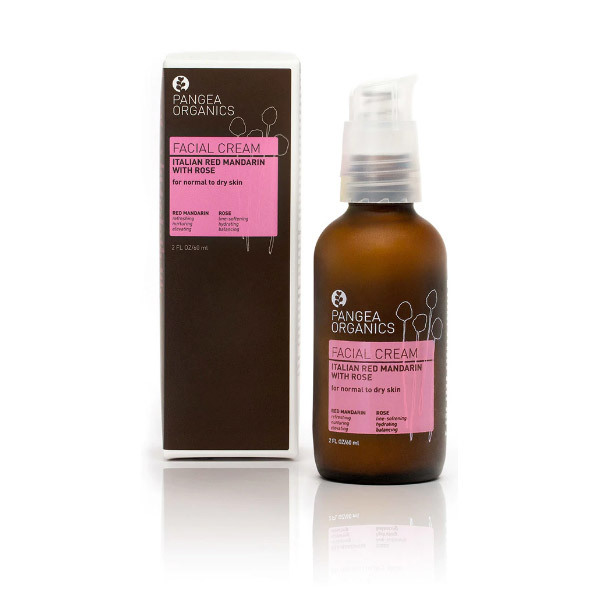 Argan and Evening Primrose Oils balance and restore mature, sun-damaged skin. Shea Butter and Sunflower Seed Oil amplify moisture with rich, essential fatty acids while working overtime as skin-protectors. Beneficial both morning and night, this concentrated cream offers robust moisture and thirsty-skin-specific essential oils and extracts. Hydrate and nourish your precious face with the highest quality organic nutrients and botanicals that nature has to offer. Following Cleanser and Toner, place 2-3 pumps into your palm, rub hands together lightly and pat your face, neck and décolleté with an upward rolling motion. Most beneficial if used morning and night. ALOE BARBADENSIS (ALOE VERA) LEAF JUICE*, SODIUM HYALURONATE, PRUNUS AMYGDALUS DULCIS (SWEET ALMOND) OIL, POTATO STARCH MODIFIED, CAPRYLIC/CAPRIC TRIGLYCERIDE, MYRISTIC ACID, STEARIC ACID, GLYCERYL STEARATE SE, GLYCERIN, AVENA SATIVA (OAT) BRAN EXTRACT, CITRUS AURANTIUM DULCIS (ORANGE) PEEL EXTRACT, CETEARYL WHEAT STRAW GLYCOSIDES, CETEARYL ALCOHOL, SACCHARIDE ISOMERATE, ARGANIA SPINOSA KERNEL OIL*, BUTYROSPERMUM PARKII (SHEA BUTTER)*, OENOTHERA BIENNIS (EVENING PRIMROSE) OIL*, VITIS VINIFERA (GRAPE) SEED OIL, HELIANTHUS ANNUUS (SUNFLOWER) SEED OIL, ASCORBIC ACID (VITAMIN C), TOCOPHERYL ACETATE (VITAMIN E), BULNESIA SARMIENTI EXTRACT, PELARGONIUM GRAVEOLENS FLOWER OIL, ROSA DAMASCENA FLOWER OIL, SD ALCOHOL 38-B, VIOLA ODORATA (BLUE VIOLET) LEAF EXTRACT, CALENDULA OFFICINALIS FLOWER EXTRACT, FOENICULUM VULGARE (FENNEL) SEED EXTRACT, EQUISETUM ARVENSE (HORSETAIL) EXTRACT, ALTHAEA OFFICINALIS (MARSHMALLOW) ROOT EXTRACT, TRIFOLIUM PRATENSE (CLOVER) FLOWER EXTRACT, GLYCERYL CAPRYLATE, GLYCERYL UNDECYLENATE, POTASSIUM SORBATE, SODIUM HYDROXIDE. *ORGANIC INGREDIENTS. THIS PRODUCT IS VEGAN AND GLUTEN- FREE. ** **MANUFACTURED IN A FACILITY THAT MAY PRODUCE PRODUCTS THAT CONTAIN GLUTEN.